ETU Huelva European Cup and Iberoamerican Championships, has two different venues; these are the cities of Huelva and Punta Umbría. 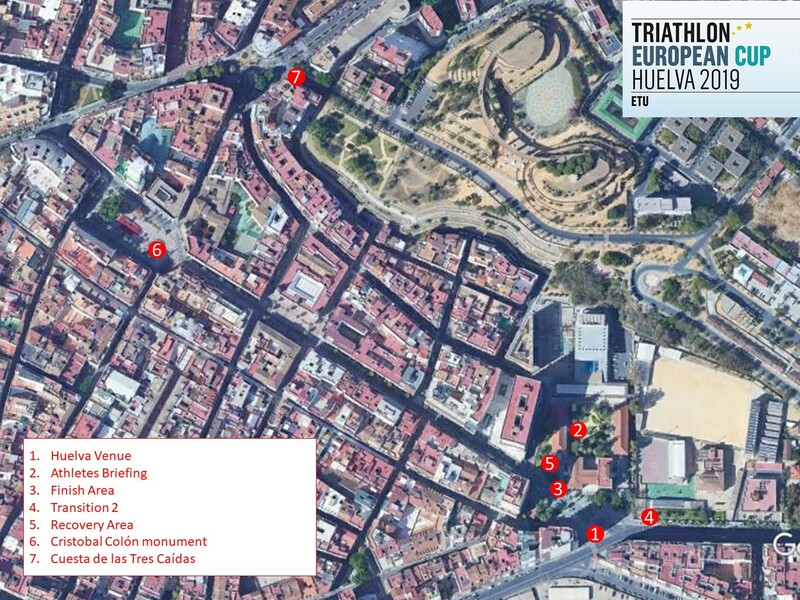 Punta Umbría will host the Swim and Transition 1; and Huelva will host half of the Bike, Transition 2, Run and Finish. Start procedures: The start, will be from the beach. The swim course has two laps of 750 metres., and the athletes will exit the beach at the end of the lap. The course is clockwise and the average water temperature is 21ºC. 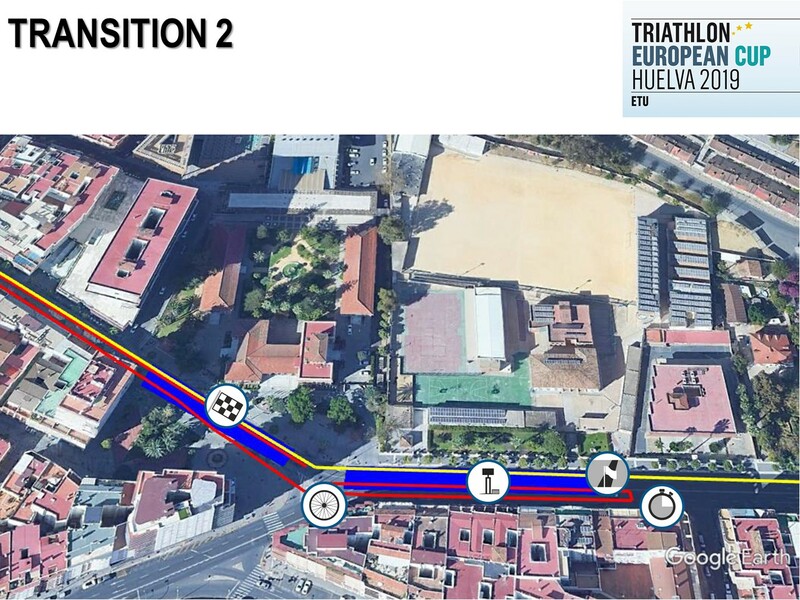 The first part of the bike course is 20,5 km before arriving in Huelva and passing for the first time through T2. This first part is totally flat, and not technical. A van with neutral wheels will go behind the last athlete. Once in Huelva the van will be in a position that athletes pass twice. The remaining 4 laps are technical and hilly, especially the street called “Cuesta de las Tres Caidas”. The team wheel stop will be allocated at “Plaza Las Monjas”, 200 metres after T2. The first part of the course, the one that is shared with the bike, is a little bit hilly until the turning point. Once the athletes turn into “Plaza de las Monjas”, is totally flat along Martín Alonso Pinzón Avenue. There will be 3 aid station along the run course; that will allow the athletes to have the opportunity to take water 3 times per lap. •	Travel to Sevilla: If you decide to travel to Sevilla, and your schedule works to take any of the complimentary services that the LOC is offering, you just have to email us, in order to book the transfer. In case not, our recommendation is to rent a car. •	Travel to Faro: There are many companies flying to Faro in Portugal. If you decide this, the best is to rent a car to drive to Huelva or Punta Umbria. It takes approximately 1h 15’. •	Travel to Sevilla by Ave (High Speed Train), and your schedule works to take any of the complimentary services that the LOC is offering, you just have to email us, in order to book the transfer. In case not, our recommendation is to rent a car. Departure transfers on Monday 25th, will be posted at the official hotels and race office, once we have all the information from athletes and coaches. If any athlete requires a specific service outside of the schedule the price is 75 € per person, both ways; from and to, Sevilla international airport, or Sevilla Santa Justa railway station. All the transfer requests, need to be confirmed to Armando Rodriguez (armando.rodriguez@triatlon.org); latest march 13rd. After that date, transfer services, will have a cost. •	In Punta Umbria, at the Official Hotel; athletes and coaches are welcome to drop their material for the run course. It will be secured by Technical Officials and ready to be placed in front of the baskets on the day of the race. Women’s bags will be white; men’s bags will be orange. •	In Huelva, at Casa Colón; athletes and coaches are welcome to drop their material for the run course. It will be secured by Technical Officials and ready to be placed in front of the baskets on the day of the race. Women’s bags will be white; men’s bags will be white. For the athletes that are staying in Huelva, at the Official Hotel in Punta Umbría, the bike can be checked in and will be locked, so the athletes can pick it up directly on race day. The Officials will be present at the Hotel from 13:30 to 14:30.